The iPad is wonderfully convenient for pulling out and working on while you are sitting, with the tablet comfortably resting in your lap or tilted up on a table. But it's still clumsy for trying to use when standing or on the go -- A bit too large to juggle with a bag, and heavy enough that it's difficult to hold securely with one hand while you're tapping with the other hand. So if you are a mobile user, check out the ingenious Strotter line of hands-free iPad cases that convert into a mobile desk so you work while standing up, with both hands free for typing. 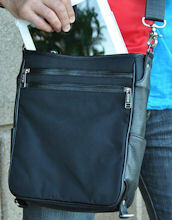 The Strotter Across is a wearable iPad case with shoulder strap. You slide the iPad into the back section of the case, flip over the magnetic smart cover, and secure with a velcro flap -- all lined with protective microfiber suede. On the ground, the cover folds back as a tilted stand for reading, typing, or watching movies. But the Across is more about flexibility on the go. The case has strap eyes on all four corners, so you can snap in and adjust the strap's length with a quick-adjust sliding buckle, to wear as a shoulder bag or even as a sling-type mini-backpack. Even better, with the strap around your neck you can flip the case open and use your iPad comfortably and securely as it rests on your waist. You even can adjust the straps to position the screen in landscape or portrait orientation. The Strotter Across fits the iPad 2, 3, and 4. It's available in two versions -- The Across GL made from water resistant full grain cowhide / leather for $99, and the Across SL made from synthetic leather for $55. The Strotter Platforma extends this idea to a convertible vertical messenger bag. At approximately 12 x 9 x 2.75 inches, it fits the iPad, other tablets, and small notebooks (MacBook Air 11"). It's designed for flexible use like the Across, with quick adjust strap that can snap on the four corners to carry as a shoulder bag or backpack. The bag is made of full grain leather and high-density nylon shell, with a bright red soft nylon lining and magnetic flap. It has two interior pockets and four outside wall pockets with water-resistant zippers. Strotter Platforma is available in multiple versions, and with magnetic hard covers for various tablets, including the iPad, iPad Mini, Samsung Galaxy Note 10.1 and Galaxy Tab 10.1, starting at $140. Screen protectors can be a good idea to protect your smartphone from the scratches and worse that accumulate from use, including banging around in your pocket or bag. But precisely aligning thin sheets of plastic on a small screen can be an unbelievably aggravating experience, even more so when working with a wet application process. TYLT, the makers of clever and fun mobile accessories (see earlier posts), have attacked this pain point with the TYLT ALIN Screen Protection System. It includes both screen protector sheets and an alignment tool for fast, easy, and accurate application. To put on a screen protector, first slide your device into the ALIN frame. Then use the tabs on the screen protector sheets to slide them onto the screen, using the guide edge to properly align them. This is a dry system, so there's no mess. The box also includes a cleaning cloth and a smoothing card to remove bubbles. The ALIN package includes two different kinds of screen protectors -- three HD Clear and one HD Anti-Glare. You can remove the sheet without leaving any residue on your device, and re-use the Alignment Tool to put on a new sheet. The TYLT ALIN Screen Protectors are priced at $24.99, and are available for the iPhone 5 or Galaxy S 4. LaCie continues its innovation in portable storage (see earlier post) with two smart new designs for USB keys (aka thumb drives). The PetiteKey provides big storage in a compact size that fits right on your keychain. It's actually shorter than most keys (1.61 x 0.83 x 0.14 in. ), and rugged enough to ride in your pocket, with a scratch-resistant connector and waterproof to 100 meters. The PetiteKey is available with 8 GB of storage for around $14, 16 GB around $19, and 32 GB around $34. The RuggedKey is a faster USB 3.0 key with more capacity, and stored in a rubber casing for additional bulk and security. It's drop-resistant to 100 meters, heat and cold resistant, and IP-54 certified for resistance to dust and water. The RuggedKey is a bit bigger (2.09 x 1.06 x 0.83 in. ), and is available with 16 GB of storage for around $34, 32 GB around $61, and 64 GB around $99. LaCie includes its Wuala Secure Cloud Storage with these keys -- one year of service of the same capacity as the key. You can back up, sync, and share files online, using both desktop software and mobile apps. Plus LaCie includes its Private-Public software for setting up password-protected areas on the drive, using AES 256-bit encryption. Beyond USB keys (see previous post), LaCie also continues innovating with portable hard drives. The LaCie Porche Design P'9223 Slim Drive is ridiculously slim and light (5 x 3.1 x 0.4 in. ), yet still solid with an aluminum design. You get a choice of hard disk or solid-state storage. The HDD model offers more capacity at 500 GB, while the SSD offers 120 GB, albeit with faster speeds (up to 400 MB/sec vs. 100 MB/s for HDD) plus additional shock resistance. But price is still an issue for solid-state drives, as the 500 GB traditional hard drive is available for around $74, while the 120 GB SSD is around $139. LaCie also stresses that the Porche Slim Drive is designed especially for the Mac. It's Time Machine compatible, and thinner than the MacBook Pro and MacBook Air (11 vs. 17 mm), with the same aluminum finish. The Belkin FastFit Wireless Keyboard Cover for iPad and FastFit Case for iPad mini offer two slightly different approaches to combining a wireless Bluetooth keyboard with a protective covering. The FastFit Case for the iPad mini has a magnetic hinge to fold down over the iPad mini to close up for travel (and to wake/sleep automatically on open/close). As a stand, it has a slot behind the keyboard to position the iPad mini for viewing, in landscape or portrait orientation. It's also especially thin, at 7 mm, and yet still has the battery capacity to run for up to 40 hours of active use, or 60 days of standby. Then FastFit Cover for the iPad is designed to have the iPad snap in (face down) to protect it for travel, and hold tight with magnets. It has two slots for standing the iPad, to angle for typing or viewing. And it runs for up to 60 hours of active use, or 2,000 hours (83 days) of standby. The FastFit Keyboards are made with light and durable anodized aircraft grade aluminum to protect the back. And they feature large and well-spaced TruType keys, with a responsive spring mechanism for fast and comfortable typing. They also have iPad shortcut keys, including volume, play control, and copy / paste. The Belkin FastFit Keyboard Case for iPad mini is available for around $71, in white/silver or back/silver. 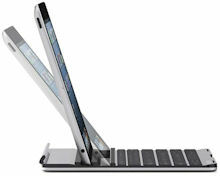 The Belkin FastFit Keyboard Cover for iPad 2, 3 & 4 is available for around $62, in black. As cell phone service goes digital, it's not just for phones anymore. We've seen Internet connectivity embedded in "smart" devices in the home -- from surveillance cameras to TVs to refrigerators. Similar, building cellular connections into mobile devices allow them to report in and be checked and updated on the fly. We've become familiar with this idea, for example, in tracking our packages across the country, from submission to shipping center to the truck out for final delivery. And now tracking is coming to consumer applications, with products like the Tagg Pet Tracker, available from Verizon Wireless. 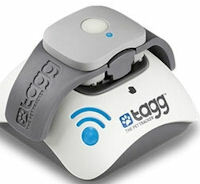 The Tagg is a small device that you add to your pet's collar to monitor its activity and warn you if it wanders away. It's just over an ounce, and is recommended for pets over 10 pounds -- so think of it more for dogs than cats. It's rugged and water-resistant for adventurous animals. The Tagg then periodically checks in with the online service to track your pet's location. To monitor your pet's health, you can log in to the service to monitor its activity levels from day to day -- to see the intensity and duration of its movements. You can set up a text or email alert if your pup goes outside a designated area, bring up its current location on a map, and track its movements over time. However, the tracking is not real time. The updates are paced by the rate at which the Tagg device connects over the cellular network to check in, which is typically around 3 minutes, but can be more like 10 minutes. The Tagg runs on a battery that lasts up to 30 days, and recharges in a docking station (without needing to plug in cables). The unit is 1.49 x 3.18 x 0.77 inches and 1.16 ounces. As a cellular product, it use GPS for location tracking and requires a mobile data service plan, like a smartphone. You also should check the system coverage maps to verify service in your area. The Tagg is priced at $99 with 3 months of service. The service then is $7.95 a month. There's nothing like lasers to make high tech even cooler -- as demonstrated by the new Brookstone Virtual Keyboard. This is a small box (around 2 1/2 x 1 1/2 x 1/2 inch) that projects a virtual keyboard on any flat surface, so you can type away without needing to carry around a bulky keyboard. The projected keyboard is around 3 1/2 x 10 inches, and includes a full row of function keys. The Virtual Keyboard does Bluetooth, so it works wirelessly with smartphones and tablets (and laptops). And it has a microUSB port so you can cable it directly to a computer. It also has a virtual mouse mode, which you can use to control the cursor, click, and do two-finger gestures. Of course, you use the projected keyboard to enable the mouse mode, and to control other setting options. The front of the unit has an OLED display which shows status icons, battery level, and the last three characters typed. The settings include the brightness of the projected keyboard (plenty bright even in bright light), the volume of the key click sound, and sensitivity for different lighting conditions. There's even built-in typing games. The way the virtual keyboard works is to project the keys using a red laser, and then use an infrared laser to layer an invisible plane of light a few millimeters above the surface. As your fingers touch the surface, a sensor then triangulates the IR reflection into a keypress. You also can choose between a one-finger typing mode and an all-in mode centered on the home row J and F keys. With a little practice, you can type pretty reliably with one or two-finger typing, much as you might on a tablet display -- including using the shift key and backspace. The Jabra REVO headphones combine a comfortable and durable design with the bonus of Dolby Digital Plus sound enhancement. The Dolby Digital enhancement comes from the free Jabra Sound App for iOS and Android (requires product key). You can play your music library with the punch of Dolby processing for extra depth and dimension, plus adjust a graphic equalizer with presets for different types of music. 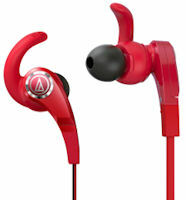 The headphones have a clean over-ear design, with comfortable memory foam cups and padded headband. And they're solid, with aluminum and steel construction, shatterproof flexible headband, and tough reinforced fabric cables. They also fold for compact storage. Jabra has tested the durability of the components, including drop (2 m), fold (3500 times), bend (10000 times), and cable (to 15 kg) -- apparently, spindle and mutilate are extra. The cable includes in-line controls for music playback and phone calls. The headphones even have jacks in both earpieces, so you can chain the sound to a friend. The result is a nice comfy yet rugged design, which delivers clear full-range sound with good separation between different elements. The headphones also are relatively compact, at around 11 ounces. The Jabra Sound App is a very nice bonus, with the clear benefit of Dolby Digital enhancement and equalizer adjustments. The Jabra REVO headphones are available for around $179 in gray and white. There's also a REVO Wireless model for $199. The Audio-Technica SonicFuel line of earphones are designed for active, daily use -- combining comfort, style, and immersive listening. The SonicFuel line (aka ATH-CKX) includes three models, 5, 7, and 9, available as earphones or in the communications version with in-line microphone and playback control / volume slider (iS suffix). The line features ergonomic C-tip earpieces with a crescent flange that nestles gently in your ear folds to stay in place for active use. The result is a nice fit that holds the earpiece in well without needing to have an over-ear attachment. The good fit also provides great sound isolation to better hear the full sound. The flat cable (in the 7 and 9 models) also avoids the cable noise you can hear in other designs. The 5 and 7 models feature "360-degree" rotating ear tips that pivot to adjust to the angles of your ear canal. The 5 model offer compact driver performance for under $50 -- $44.99, or $49.95 w/ mic, in black, white, red, blue, and green. The 7 model adds an enhanced driver system, flat tangle-free cable, and carrying case for $74.99, or $79.95 w/ mic, in black, white, blue, red, and purple. The 9 model adds large 13.5 mm drivers for deeper bass and stronger highs, for $94.99, or $99.95 w/ mic, in black or silver. These include a generous selection of C-tips (S, M, L) and ear tips (XS, S, M, L). Plus the 7 and 9 models add Comply foam tips that form to the shape of your ear canal. Entries posted to Manifest Tech Blog in October 2013, listed from oldest to newest.